There are 10 fewer mouths to feed at the Aquarium today, and the Marine Animal Rescue Team couldn’t be happier. Yesterday the team released 10 critically endangered Kemp’s ridley sea turtles at Dowses Beach in Osterville. They have been being rehabilitated at the Aquarium since they were rescued on Cape Cod beaches late last fall. Each summer, Kemp’s ridleys migrate up the East Coast to Cape Cod Bay to feed, and each fall as the water cools they head south again. 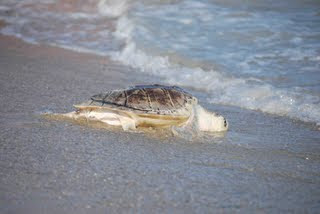 But each year, many of the sea turtles are trapped in the arm of the Cape; as the water gets colder, the sea turtles’ body temperature drops and they become lethargic and weak. The wind and waves wash many of these turtles onto the shore, where volunteers from Wellfleet Bay Wildlife Sanctuary collect the animals and bring them to the Aquarium. The sea turtles are usually suffering from hypothermia and pneumonia and sometimes also have cuts, abrasions and cracks in their shells caused by fishing gear or boat propellers. Read about the treatments and procedures that the Marine Animal Rescue team and the veterinary staff perform when the turtles arrive at the Aquarium in this post and by browsing all of the posts on the Marine Animal Rescue blog. You can read more about the release in this post. See video of the turtles' release on NECN's website.